For the record, I do not condone any diet which is made up primarily of processed foods. My dietary goal is to eat as many nutritious whole foods plant-based meals as possible, keeping processed foods to a minimum. However, there are days when I just don’t have the time to get to the market for fresh whole foods or I am just too tired to cook. On these occasions, frozen foods are often just the thing! They are also great if you are transitioning to a vegan diet. There are many great frozen food products to choose from, but I find myself drawn to the same ones over and over again. I made this list of some great vegan frozen foods which I thought may be useful to you. I have tried almost all of them with a few exceptions, which I heard were really good from people I trust. I was thrilled when Amy’s came out with this vegan pizza. I think it’s amazing and I often add extra Daiya cheese shreds to it when I make it. …including Amy’s Bowls made with Tofu, Brown Rice and Vegetables, Amy’s Vegan Burritos and Wraps, Amy’s Quarter Pounder All-American Veggie Burgers and Amy’s Tofu Scramble In A Pocket Sandwich. 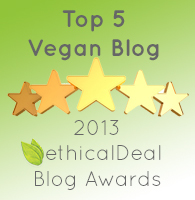 Amy’s makes other great vegan frozen foods but the ones I mentioned are my personal favorites. My husband, Jeff, loves the Amy’s Indian Wraps! *Please note: Not all of Amy’s products are vegan. If the product is vegan, the word “vegan” will appear on the back of the package just before the list of ingredients. This entire line of frozen food products are terrific, but my favorites are Candle Cafe’s Macaroni and Cheese and Candle Cafe’s Tofu Spinach Lasagna. These are surprisingly good. I would actually consider using them as hors d’oeuvres at a party! My husband absolutely loves this Field Roast product, so I have it at almost every holiday meal. I make it with a vegan savory mushroom gravy. Boca Burger’s veggie burgers are reliable “oldies but goodies.” I prepare mine on an Ezekiel Sesame Burger Bun and top with red onions, lettuce, tomato, avocado and ketchup. I really love Trader Joe’s frozen falafels. I throw them on top of salads with some hummus, put them in pita pockets with some tahini and lettuce, or eat them alone. …including Trade Jose’s Dairy Free Mildly Spiced Vegetable Burritos, Trader Joe-San’s Vegetable Fried Rice, Trader Joe’s Organic Superfood Pilaf (Tri-Color Quinoa Blend With Sweet Potatoes, Kale & Carrots), Trader Joe’s Organic Brown Rice in 3 individual microwaveable pouches, and Trader Joe’s frozen portions of Steel-Cut Oats. Trader Joe’s is incredibly vegan-friendly and their frozen foods section has a wide variety of vegan stuff to choose from. I suggest that you peruse through the items and find ones that you like. I really like Nate’s Italian Meatless Meatballs and the Savory Mushroom Meatless Meatballs. I heat them up with either marinara sauce or the OrganicVille brand of Chili Sauce. The Gardein line of products are fantastic! However, Gardein’s Mandarin Chicken Nuggets and Crispy Chick’n Patties are my personal favorites. 11. Van’s Dairy & Egg Free Frozen Waffles and French Toast Sticks. These are dairy-free, egg-free, gluten-free and wheat-free and are great for a quick breakfast. They are also good alternatives for your kids who may be “stuck” on some of the more popular supermarket brands. These are both great veggie burger choices! My friend Ellen likes to float her Gardenburger Malibu Burger on a Coco Lite Pop Cake Raft with the fixins. My friend Beth’s 15-year old daughter recently went veggie, and she really likes these Veggie Patch faux nuggets. I recently tried this frozen Kung Pao Chicken for the first time and I was seriously impressed. It would be excellent over brown rice and a side of vegetables! If you haven’t already, give this one a try! Dr. Praeger’s makes a wide variety of vegan patties and food items. I don’t use them on a regular basis, but I have many friends (non-vegans) who really like them. It’s worth checking them out. 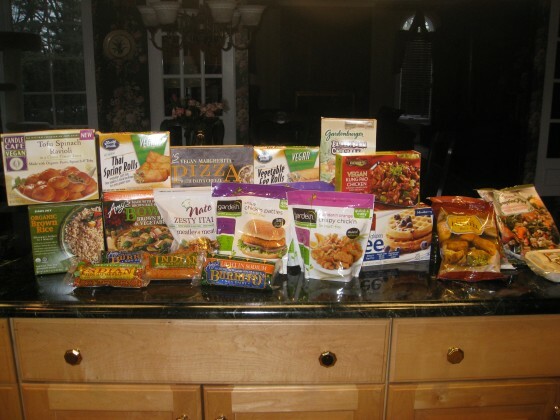 There you have it…my list of vegan frozen food recommendations. Hope I gave you some good ideas. Bye for now! Of course, I would love to try them. I will contact you with a mailing address. This is great!! I am new to Vegan grocery shopping and tried doing research online. This helped out a lot!! I am still trying to locate the Meatless Meatballs and a few other items but I sure with time I can locate them. Glad it helped you. Look for the Sprouted Tofu meatballs by the Wildwood brand too. They are good, and they are in the refrigerated section, not the frozen section. Beware that many plant based “vegan” foods, may contain GMO soy, corn, potatoes. or apples. Corn IS vegan, but I wouldn’t want to eat Monsanto’s Round Up ready GMO corn. “contaminations”, are not allowed in Organic food, but most packaged vegan foods, are NOT organic, which could mean they contain GMO ingredients. Dear Cautious—thank you for the input! GMO is an important issue that we always have to be aware of! Thank you for reading and commenting!